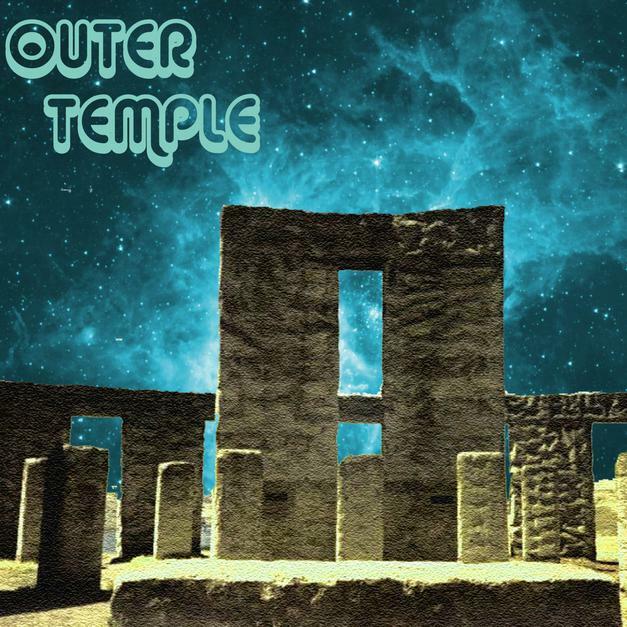 Outer Temple are a Toronto, Canada based ensemble who cover a lot of stylistic ground. Utilizing electric and acoustic guitars, bass, keyboards, synths, saxophone, drums, and a variety of percussion, including tablas, djembe, and berimbau, this all instrumental band can rock hard, crank out the grooves, go into space, psychedelia, and ambience. Among my favorite tracks is The Hollow Earth, which starts off as an accessible and nicely melodic bit of atmospheric space-prog, but gets increasingly heavier and takes some interesting compositional twists and turns near the end, and gets downright crushing in its last moments. Lots happening in less than 5 minutes. Fantastic Voyage is precisely that… an ambient space-jazz and chill-out grooves excursion, colored by a variety of soundscapes and effects that all flow beautifully for 11 luscious minutes. The first half of the 10 minute Into The Blackness is a completely mind-bending psychedelic space exploration, transitioning to a heavy grooving and still psychedelic space-prog rocker for the second half, parts of which reminded me of Porcupine Tree. And then there’s the nearly 18 minute epic The Dreamquest Of Unknown Kadeth. This is the third album I’ve reviewed in the past year that’s had a track inspired by this H.P. Lovecraft novella. It opens with a wildly rhythmic mixture of acoustic guitars and space electronics. As the full band joins in the music develops some major melodic hooks, and then blasts into a high energy space-prog rocker. Around the 6 minute mark things ease into a quieter transitional segment with tablas, sparse, intermittent acoustic guitar, soundscapes, synths and other fun effects. Then approaching 11 minutes the percussive pace picks up and it feels like Hawkwind with an ethnic vibe, before returning to the opening theme. The remaining tracks are very good too and explore some interesting territory. Magma Baby rocks hard with a jazzy element at times to the drums and keyboards, a King Crimson-ish edge to the guitars, and some of the rhythms have an off-kilter repetitive groove that remind me of early Circle. Arise is an accessible and nicely melodic hip shakin’ ambient groove rocker. Something Witchy kicks the grooves up a few notches, supported by awesome percussion and killer freaked out effects. Unhinged is a short, punchy heavy rocker with freaky effects. Psychomanteum has a 60s psychedelic feel. And Shrunken Heads borders on Metal at first, but then becomes a tightly wound 70s styled slab of blistering hard rock with spaced out effects, in the end adding some swingin’ percussion. I quite enjoy this album, though it might be a wee bit too varied to get a sense of what Outer Temple are really about. I’ll be keen to hear what they do next.